Jigsaw School Apps is an independent British company, part of More IT, founded by Darren Kempson and Nathan Beardmore. Darren is a Chartered IT Professional with over 18 years experience in the IT industry. He’s held a number of varied positions including DBA and Security Consultant for a number of government departments while working for Fujitsu. After that he went on to found A+ Websites, developing websites and providing IT support for schools. Nathan graduated with a degree in Computer Science from Liverpool University, then worked as a network manager at Leek College. He later became a Microsoft Certified Trainer, providing systems engineering training in the UK and Ireland, before founding Jigsaw School Apps with his former student Darren. In his spare time he is an indie game developer, most known for his award-winning Windows 8 game "Interference". 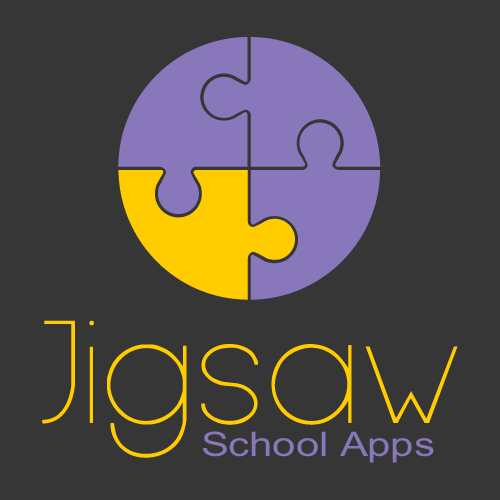 Having previously worked on a number of projects together over the last ten years, Darren and Nathan founded Jigsaw School apps in 2013 to address a gap in the market, namely to develop a new way for schools to improve parental engagement using smartphone apps. They created a prototype, and the reaction it received was so amazing they decided to concentrate on making apps for smartphones and marketing them to other schools and institutions that need to keep in touch with stakeholders or customers. Jigsaw School Apps now has over 300 subscribers throughout the UK – a variety of primary/secondary schools, colleges, and other organisations. 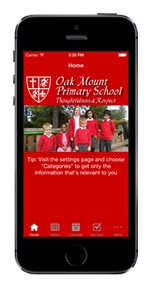 Each school receives a set of their own branded apps that are made available in the iPhone, Android and Windows stores. These are then free for parents to download, and are easily found by searching for the school's name in their phone's store. The apps boast a first for school communication tools: an automatic translation feature which allows parents to choose which language they’d like to read the information in. 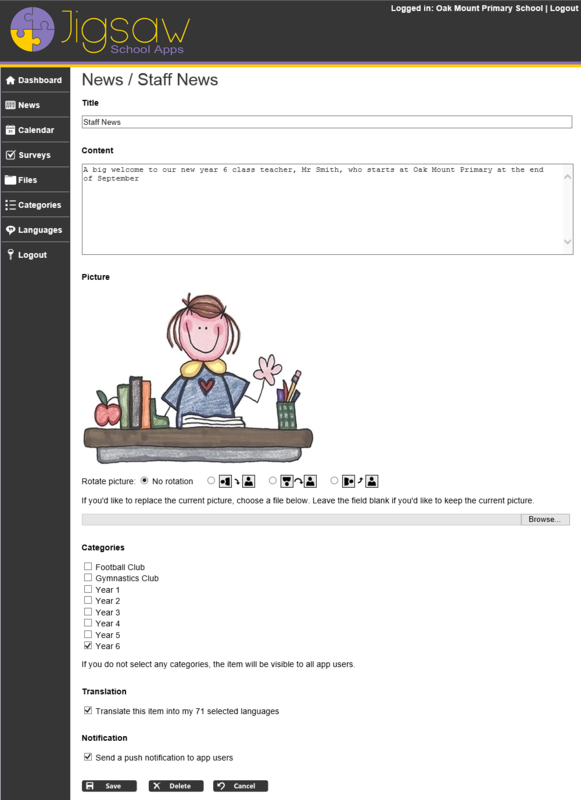 Other features include: surveys, allowing schools to obtain parent feedback easily and quickly; a calendar which allows parents to set reminders for upcoming events; a document store, where schools can share files such as lunch menus or homework sheets. 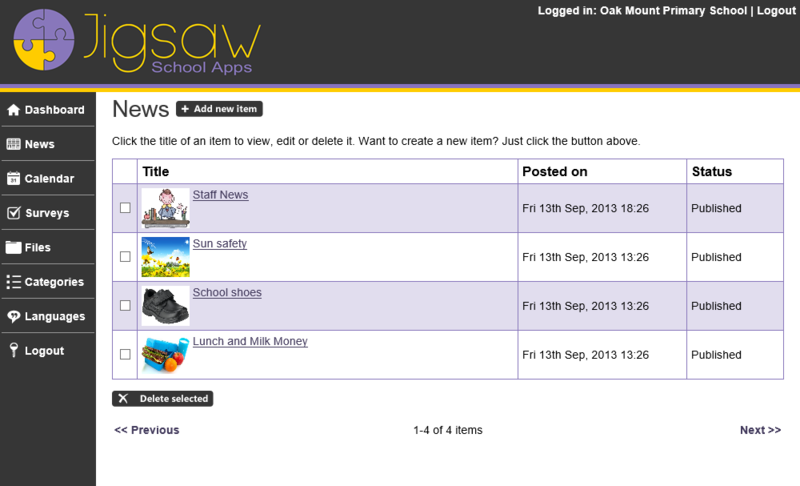 For a full list of features see the website at jigsawschoolapps.com. Schools pay a flat yearly subscription – no cost per message as with older text-messaging systems currently in use. "The uptake and feedback for the app has been very impressive – helping us reach some parents who have been previously difficult to engage with. The support provided for the app has been outstanding – a parent noticed a scrolling issue on her windows phone and mentioned it to me in the morning, and by the afternoon an update had been rolled out across the different platforms. I was able to get in touch with the parent that afternoon, who told me the app had already updated and was working perfectly! 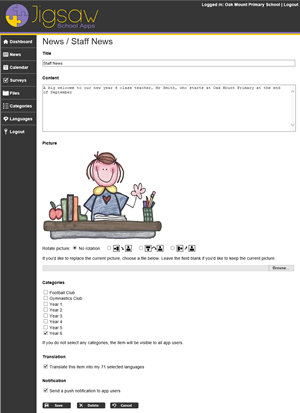 The survey function has proved invaluable as a way to supplement our understanding of parents, as we have used it to mimic the questions asked on the Ofsted ParentView website. Obviously, this doesn’t replace the information on there, but it allows us to engage with parents who may, for whatever reason, be unable or unwilling to take the ParentView survey. Around 60% of our app users respond to each survey question, significantly more than the 30% or so who respond to paper questionnaires. Jigsaw are also eager to listen feedback about how we can tailor the app to meet our needs further and we’re looking forward to seeing how we can further integrate the app into our communication in the future." 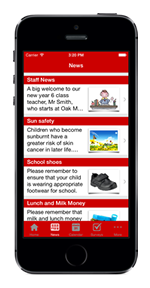 "Having used the App for over three months now, I can honestly say that it is certainly the most effective communication tool that we use in school, an opinion which is supported by all members of our school community, including parents, children, governors and friends of the school. 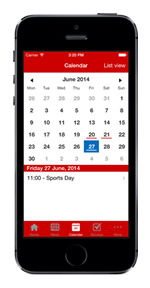 Whilst we have a vibrant website which is updated several times a day, many parents have commented that they prefer to access the App when 'out and about' since it is designed specifically for this purpose and they can receive instant updates throughout the course of the day. 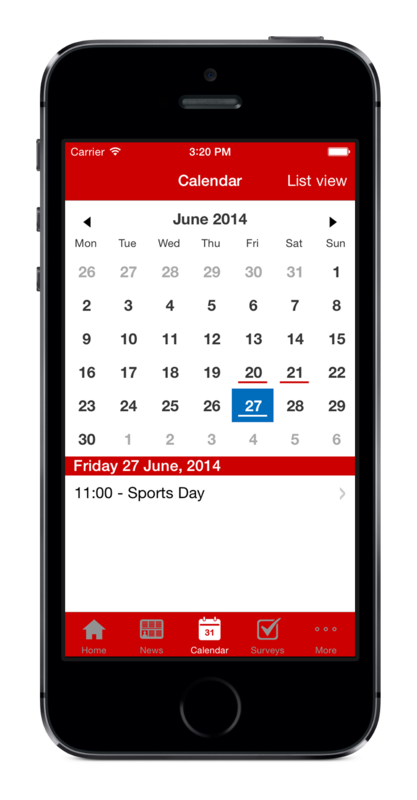 Also, the ability to save dates to personal calendars on their mobile devices (with the added functionality of setting reminders) is another positive feature. As well as this, users like the fact that they can ‘filter’ which posts they receive based on the categories set up by the school. We are incredibly 'Appy' with our App!! Thank you, Darren and all at Jigsaw!!" "Since having our own school app, parents have commented upon how much communication has improved and how impressed they are with the opportunity to access dates, information and updates regularly. It was set up quickly and professionally, it is very easy to update information, photos and even survey parents. 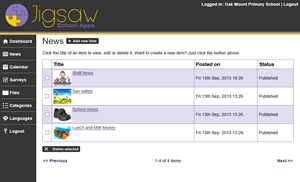 It is excellent value for money and now our key way of sharing information with parents."